Over the past few years I’ve spent a lot of time duplicating the damaged trim in my old house. 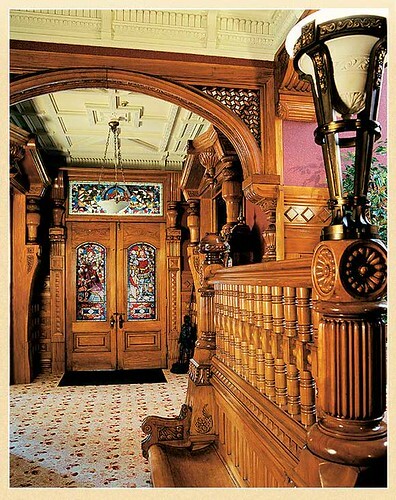 Elaborate woodwork is one of the major details of an old home as well as one of its greatest attractions today. People with old homes go to great lengths to carefully strip and rehabilitate their old baseboards and casings. But sometimes the woodwork is so damaged that rehabilitation isn’t a practical option. Such was the case in my old house. One question I get asked a lot is, “where did you buy your window and door casings?” In the olden days, trim work wasn’t something you picked up at a home center. Even with modest turn-of-the-century homes, moldings were typically constructed by a master carpenter working with the architect and a local mill. Compound casings are one of my favorite projects — not so much because they’re a woodworking challenge, at least with my amateur design abilities — but because they’re a lot easier to construct than they look. 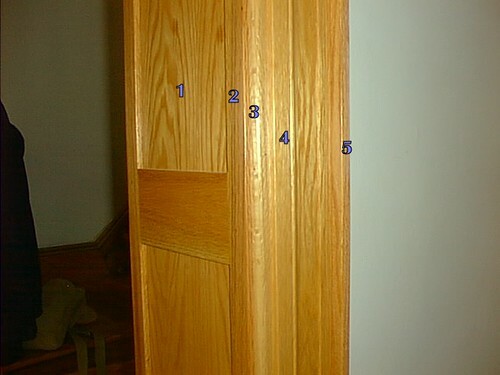 The trick with compound woodwork is to create setbacks and shadow lines. Below is a relatively simple example, which I annotated to show the various components. This is the entrance to my living room. 1 - I started off by building the base surround. This was leftover red oak plywood from a cabinet project. I shimmed it straight and plumb and fastened it with 10d finishing nails to the jack studs and header. I like using veneer plywood for this anyway because it’s more stable and the color is usually more uniform than plank lumber. 2 - next, I glued on some red oak lathing. This was cut on my table saw into 3/8″ strips from a scrap of 6/4 lumber I salvaged from the demolition here. The wide horizontal piece was a leftover stair riser scrap from when I built my basement stairs. I ran it through the planer to get it down to 3/8″. 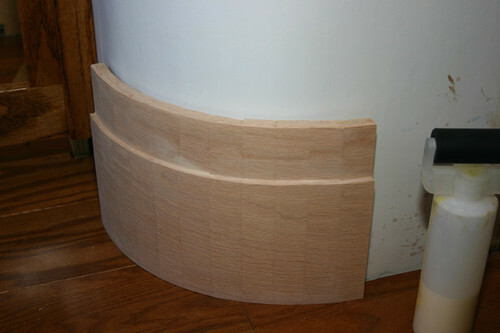 3 - next was 3/4″ quarter round that I made on my router table from a long scrap of red oak. Actually, I installed 4 first, then filled the gap with this. It served two purposes. It gave a nice turn to the wall casing but, more importantly, it hid the plywood edge on the surround. 4 - next was some store-bought casing, Dyke’s #605 to be exact. Except for the crown molding over the doorway it was the only lumber I bought for this job. Since then I invested in some casing bits for the router table and cut my own, which has saved me over two dollars a foot for the 400+ feet I’ve built since. 5 - this is a 1/2 x 1-1/2 return to the wall built from (you guessed it) a scrap that I ran through the planer to take down some of its visual weight. Then I used a 1/4″ roundover bit to ease the sharp edges. It serves another purpose too: to give a flat abutment for the base molding. Unless you live in a spectacular home like this (the Carson Mansion in Eureka, CA), building compound details is really more about using your imagination than it is black art woodworking skills. In my case it’s also about fusing my sense of cheapness with art. I tend to build around whatever lumber scraps I’m tripping over in my shop at the moment. Fact is, all of my doorways are a little different and constructed from whatever I had on hand in the scrap pile. Plan your nailing points to disguise the nail heads as much as possible and provide a solid nailing surface for the casing. I use a lot of carpenter’s glue on these things and rely on squeeze clamps and brad nails to tack it together till the glue dries. 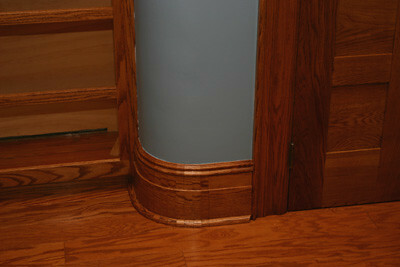 You can also use compound moldings and casings in your baseboards as I did here.